It’s visionary to eat healthy. What we put into our bodies today will, in many ways, determine our health tomorrow. God gave us food to delight us as well as to nourish our bodies, and there is beautiful balance in the natural foods He has provided. Over the years I’ve tried to feed our children as healthy as possible, knowing that in certain seasons it is less possible than other seasons. For example, after a new baby comes into the house, the spelt pancakes and raisin carrot muffins for breakfast go flying out the door…and in walks the cheerios, raisin bran, and frosted (anybody judging?) shredded wheat. I have been on serious health food kicks over the years. Probably the worst experience was when we tried to “go raw” for a while. My husband put an end to that after the third night of an undefinable, seedy type of casserole followed by a “cheesecake” (his favorite dessert) made with ground nuts. The recipe said it tasted EXACTLY like the real thing. One of the frustrating things about trying to eat healthier, whole foods, is that it takes more preparation time, and when you get busy with more and more children, prep time is at a minimum. The other frustrating thing I’ve found is that when I don’t have the right tools, I can’t do the right things, well…right. Enter the Vitamix. I’ve made whole grain pancakes and waffles, applesauce, smoothies, crushed ice, chopped onions and carrots, play dough, soups, peanut butter, and chocolate malts. (Hey…chocolate malts are very good for the soul…if not for the gut.) I even used my Vitamix to help me go into labor. How did I live without this machine? I think I will forevermore look upon my life as “pre-Vitamix” and “post-Vitamix”. “Pre-Vitamix”, I had a friend and her children over for the day. I made some kefir and berry smoothies in my regular style blender. She watched while I painfully wrestled with the blender and the ingredients for 10 full minutes before I finally had something blended well enough to choke down. There was only enough for each person to have a tiny glass. This is why smoothies, while healthy, were not something I would anticipate making…and therefore made only on rare occasions. And I believe our “going raw” experiment would have been more pleasant and realistic had we owned a Vitamix. 1. The size of the container is HUGE. It holds 8 cups worth of whatever you are making. That’s enough for our family of 10 to each have a 6-7 ounce glass, if we are making smoothies. It also holds enough batter to feed our family the number of pancakes/waffles we need…and then some. 2. It is LIGHT. My old blender container, made of thick glass, weighed a TON. This one is so light it makes lifting and pouring easy…even for kids. 3. It blends up smoothies and blender pancake/waffle recipes with any kind of ingredient painlessly. And we’re not just talking bananas, berries and milk here. I can put an entire carrot in there…and it will blend it up with my fruits smooth as silk. In 30 seconds. 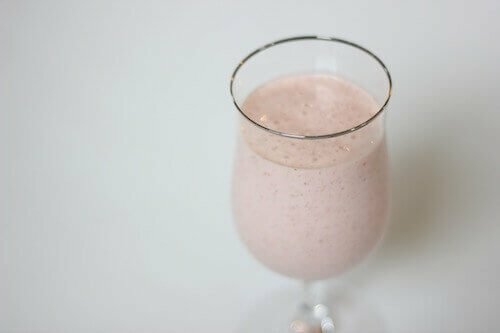 This morning I put whole flax seed and almonds in our strawberry banana yogurt smoothie…and it was smooth and creamy rich. With my old blender, virgin coconut oil would never get completely blended into the smoothie. Instead, we could feel the tiny globules of coconut oil in our mouths. (Raw, virgin coconut oil is good for your gut.) But with the Vitamix, I can dump in a big spoonful of the stuff…and it gets completely emulsified in with the rest of the ingredients. In 30 seconds. I’ve thrown in fresh spinach leaves and avocado…without telling my kids…and it blends up so well, they have no idea those things are in there. 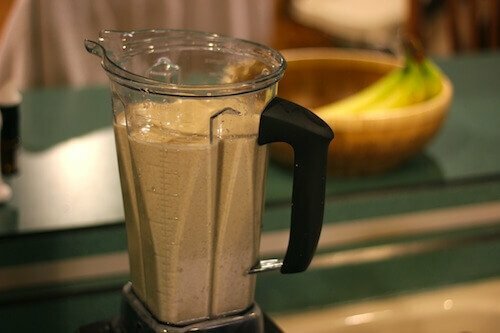 With my old blender, I had zero success with whole grain blender batter recipes that call for blending whole grains in with the other ingredients in one step. With the Vitamix, I can throw in any whole grain to make a pancake or waffle batter that rivals anything we’ve ever tasted in the past. My family loves the pancakes and waffles I make, and I’m able to add flax seed, almonds, just about any ingredients you can imagine. You can puree baby food in seconds with this machine as well. 4. The lid doesn’t fly off when pureeing hot foods. I can’t tell you how many times I’ve had hot, pureed veggies for cream soups splattered all over my ceiling, counter top, and face with my old blender. Not any more. My face is safe, thanks to Vitamix’s unique lid that “locks” into place. Creamy asparagus soup is heaven to make. And even more heavenly to eat. With a clean face. 5. I can weed out several other appliances from my kitchen, thus simplifying life and conserving space. I no longer need my blender, food processor, coffee grinder or grain mill. Yes, if you have the dry container, which is an add on, you can grind coffee beans and mill any kind of whole grain into flour. You can crack whole grains too in order to make hot cereals like oat groats. I often need to grind organic herbs into a powder for some of my DIY recipes. Not a problem with my Vitamix. 6. This machine enables me to feed my family more whole foods, more painlessly and pleasantly than any other piece of equipment I have ever owned. 7. A seven year warranty. Free shipping to their repair center and back should your Vitamix need help. Isn’t it Just a Glorified Blender That Costs a Mint? Not everyone can afford a Vitamix. We certainly could not until this year. This post isn’t intended to cause coveting, bitterness or nagging of husbands. However, even when we’ve been quite poor, God has graciously enabled me to creatively figure out ways to acquire tools that I feel are helpful to my homemaking. So why haven’t I owned a Vitamix before now? I wasn’t convinced it was necessary. The Vitamix is so much more than “just a blender”. It is the best way I’ve discovered, thus far, to incorporate healthy, whole foods into my family’s diet. Save your shekels. Say “no” to other things and save for this one. Ask for money for your birthday and Christmas…and put it aside for a Vitamix. This is how I’ve been able to acquire some of my most beloved, quality homemaking tools. Do you own a Vitamix or Blendtec machine? Share what you love about your kitchen tool with the rest of us! Let’s Save Some Money: The Eat from the Pantry and Freezer Challenge! I have always wanted a Vitamix since I saw it on Martha Stewart years ago. I currently altrenate between a pretty decent blender and 2 food processers, when one of them dies….I will own one! I didn’t wanna spend the money on a KitchenAid Mixer, but it’s been awesome for our kitchen. Perhaps this will be added someday too…but for now it’s adoption fund-raising!!! 🙂 Thanks for sharing! I have a stick blender that does the job for us. My sister and sister-in-law both have Vitamixes and loooove them. Maybe one day! I love my stick blender too! I LOVE not having to wash a lot of pieces. My cheapie from WalMart can do almost all of those things. (besides pureeing a whole carrot) I make blender pancakes in it all the time. Also, I can screw a mason jar into the base and have a smoothie to drink right out of the jar and no dishes. I can calso grind coffee beans in a small mason jar screwed into the base. I also already own a Nutrimill and Bosch mixer, so it would be silly for me to buy a Vitamix. So excited to see this post. I just bought a vitamix from Costco when they were running a special. Mostly for my youngest son who will be getting a feeding tube in the near future. The conventional doctors and dieticians want me to pump him full of formulas filled with junk and this way I can simply just take what we are eating, add extra nutritious calories and blend it up for him. I am so excited to have this option! I might become a convert. I have a loaner Nutrimill right now, and I’ve said if it ever leaves, I might replace it with a Vitamix instead. I have a small kitchen and I’m all about multi-tasker appliances. I am a long-time convert. I grew up with my mom using the old-style square metal canister Vita-mix. She made Refigerator Cleanout Cake and Whole Wheat Crazy Cake from the Vita-mix cookbook. It eased my first cooking attempts as an 8-year-old. Now, having been gifted the latest Vita-mix as a wedding present, I am as loyal as ever. It really can do almost anything! And, it’s going strong after 5 years of solid use. I’m glad you are supporting such a worthwhile product! I used to think that I could do everything with my blender that could be done in a Vitamix, then my parents decided to purchase one. Every time we would visit I used the Vitamix more than them. I don’t have to lose any nutrition from having to peel and core fruits/veggies for smoothies (except apples because of the cyanide in seeds). Plus, the smoothie was actually smooth, not gritty like mine. I was astonished when I had piping hot potato soup in 7 minutes. Just last month for my birthday, my mom surprised me with my very own vitamix and I LOVE LOVE LOVE it! I’m still working on the amount of foods that need to go in to get the desired serving sizes I want. If she had not given this as a gift, it would probably be over a year until I would have enough saved to purchase one myself. I might have to add this to my wish list! I’ve been wanting to get a good food processor but if this is something that could replace a food processor as well even better. I’ve got one of those dual food processor/blender machines. The blender works ok but I have to puree for about a minute to get a smoothie smooth enough and the fp about leaves you deaf. It’s hideous. I do have a Kitchen Aid which I love. My parents gifted it to me as a wedding gift. My mom’s still works wonderfully after 38 years. Funny, this was exactly what I was thinking this morning when I blended frozen bananas with breakfast with my Blendtec. No liquid necessary & they came out creamy smooth – just like eating banana ice cream! I’m glad I made the investment. Now talk me into a dehydrator! I used I Vitamix when I worked at a coffee shop. We used it solely for making ice cream shakes. Its a workhorse. I would love to have one at home and try other uses. I have a BlendTec and I LOVE it! I use it daily for my green smoothies and all kinds of other things. My hubby loves to make peanut butter with it. I bought mine at Costco during one of their promos, but since they only do that twice a year, I discovered you can order one from Bed Bath and Beyond and as long as you order IN the store, you can use a 20% off coupon – so good if you want one and Costco doesn’t have it at the time. I also bought my Blentec at Costco during one of their promos. I love it. I use it all the time. I’ve even ground wheat berries into flour. It is a work horse. Of course, I’ve never had a VitaMix. I might like that just as much. I got a vitamix this year and LOVE IT!! I wanted one for four years and finally got one. It is amazing!! Way better than my old blender. I hated putting spinach in smoothies before because the blender would always leave chunks of spinach leaves and it grossed me out. So I only used the blender for certain types of smoothies. But my vitamix….. Oh man!! That thing is a miracle machine!! It’s so hard to explain to someone who is happy with their regular blender why a vitamix is worth the money, but it absolutely is! I’m absolutely with you, Natalie. I make amazing smoothies for our family almost every day (gosh, sometimes even twice) and I love that I can easily blend in things like whole flax or chia seeds, and you can never tell. Frozen fruits are a piece of cake, and so is turning that frozen fruit into ice cream (add a bit of cream or whole milk and some honey and vanilla, and voila!). I also do a lot of grain grinding in there, when I’m making batters for pancakes, waffles, muffins, quick breads, etc. and it just makes the whole process so easy. If mine died, I would save up to replace it as fast as I could! I have owned a Vitamix for 6 years and use it all the time. One of the best appliances I ever purchased. Just recently my variable control knob stopped working. I called VItamix, they looked up my warranty, sent me a prepaid return label, I called Fed Ex for a free pick up at my home. I returned everything except the lid and tamper. In less than two weeks I received a NEW container and new mechanics on the motor unit. There was no charge, NO HASSLE. I must say their customer service is superior. we LOOVE our Blentec! Ive been making smoothies with it mostly but have made some raw brownies (dates, nuts, coconut oil, etc) in it as well. I would love to get a great healthy recipe for blender waffles! Do you soak them first? I’m curious about which appliances are essential in a traditional foods kitchen (and only interested in tools that will last a lifetime, with minor repairs here and there). I would like an Excalibur Dehydrator (we have an urban farm). I am wondering if I had to choose between a Kitchenaid mixer and a Vitamix, what would you suggest I choose? Is there any reason to get both? I feel both are essential, i love my kitchen aide, when making cakes or cookies, you can just turn it on low and i just go to cupboard and get my ingrediants add and can just put back, helps keep me organized for my baking, i think the vitamix is too powerful for making cakes and i dont think it will do well with cookie dough..its worth to put out the initial money for both because they will last forever. i use to have to buy a blender every year, from the 50 dollar ones to the 150 dollar ones and i would burn them up or something would break. i have had my vitamix for 3 years no problems, and really there is a 7 year warranty, so in case something does happen you can get it fixed or replaced. so average it out, way cheaper to just put out the money. we neve go out to eat, i cook everything and having these appliances makes it so much easier..
You might be interested in a Bosch mixer. You can buy a Blender attachment. It is a powerful machine and if you bake bread, pizza dough, etc. regularly, you’d love it. My Vitamix is the one thing I wouldn’t want to be without, also! …still going strong after more that 25 years! I’ve used it almost daily for all that time and have never even had a repair bill! It came with a metal container and years later I added the lightweight plastic container and liked it even better. I have been toying with getting one of these! 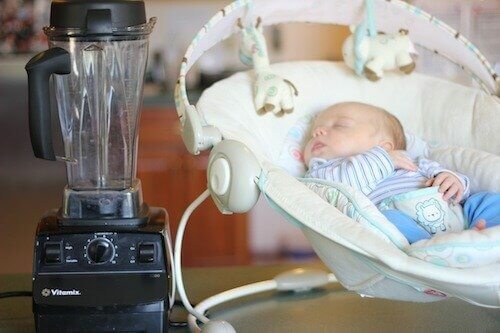 I hate trying to make smoothies in my blender, it doesn’t blend anything!! It’s a pain! i want a vitamix! i have been waiting for my blender to die, since it does pretty well, and to save up enough $… i have also been keeping an eye on them on craig’s list. i was already convinced i wanted one before your post, but your post was very convincing as well! im currently debating on whether to purchase a blend tec or vitamix. Anyone have any thoughts which is best and why? I love my blendtec. I push a button and walk away. Had a vitamix and like my blendtec much more. Got great deal from Costco. The wildside jar is a must have. I use the soup and smoothie buttons all the time and the batters button. Love it! I have been debating on which one to get. Can the blendtec grind wheat berries as well as the vitamix? Thanks for helping remember to save! For those who can’t afford the VItamix for now, we have LOVED our $99 Ninja. It does so many things well, that our regular blenders never could. I have never ground wheat, and Kale won’t completely disappear in a green smoothy, but all in all it is a tremendous machine!! We have just the Ninja blender, not the multi-thing. My husband surprised me with a Blendtec for our anniversary last year, and I use it every day–sometimes twice or more! I thought, like several commenters above, that my cheap blender did a good enough job, but the Blendtec really makes smoothies a much better consistency than the sludge that my old blender produced. Now my smoothies are light and almost fluffy (that’s weird, but true! ), even with tons of vegetables packed in. I’ve done some blender pancakes and a few soups, but mostly I make smoothies. 1. I liked the preset buttons on the Blendtec, though I frequently press the smoothie button twice because things get just that much smoother and lighter. 2. The Blendtec is a bit shorter than the Vitamix, allowing it to fit underneath upper cabinets on the kitchen counter. I knew I would be storing it under a cabinet, so that was important to me. 3. The Vitamix requires the purchase of a separate canister to grind grains, whereas the Blendtec uses one canister for everything. It saves about $100, if you plan on grinding grain. The Blendtec does not have a locking lid, but that hasn’t been an issue for me. If you make a lot of hot soups, it may be something that will matter more to you. Also, I thought I might get rid of my Cuisinart food processor once I got the Blendtec, but I still use it several times a week for making pie dough, biscuits, shortbread, etc; as well as for shredding things like cheese and carrots. I have a ton of appliances, but I use them all on a regular basis and love them all! I was wondering which vitamin you have? Drinking fresh fruits and mix it using blender is still a good choice rather than powder juices. To keep our kitchen tools clean and safe bottom mount racks is perfect to store our kitchen tools. I can’t say enough fabulous things about my Blendtec! I have a completely plant-based and gluten-free diet, which would not be possible without my Blendtec. Costco has the best deal, including the extended warranty. Prior to purchasing my Blendtec, I would go through a blender every six months and I wasn’t even using them every day! My Blendtec paid for itself in less than 2 years! It replaces at least 4 appliances, is easy to clean, fast, and doesn’t require much food prep. If you are on the fence, purchase one from Costco and try it for a month. If you aren’t satisfied, take it back.